Masaki Honda was born in Japan in 1889. He joined the Japanese Army and in 1940 was given command of the 8th Division. This was followed by the post as head of the Military Education Branch Armoured Department (1941-43) and the 20th Army (1943-44). In April 1944 was given command of the 33rd Army in Burma. 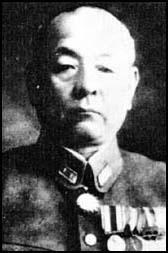 With the support of Lieutenant General Raizo Tanaka and the 18th Division, Honda had to cover the threat of the Chinese Army in North Burma. In January 1945 Honda was ordered to hold a north-south line from Lashio to Mandalay. Honda was under instruction to stop General Joseph Stilwell and the US-Chinese troops from reopening the Burma Road. Attacked by General William Slim and Frank Messervy, Honda was forced to retreat through southern Burma and the British Army was able to capture Rangoon on 3rd May 1945. Masaki Honda died in 1964.